With Valentine’s Day coming up in just a few weeks, we decided to compile a list of how rose petals are used to create a romantic evening. Some are obvious, others are quite creative, but all will show that special someone how much they are loved. The trail. Okay, so we start with an obvious one. Whether it’s a sprinkling of a few here and there or a thick carpet of petals, you’ll need to create a path from the door to someplace special. The bed. If you created a trail, chances are it leads to a bedroom. What better way to decorate than to have rose petals strewn across the bed. 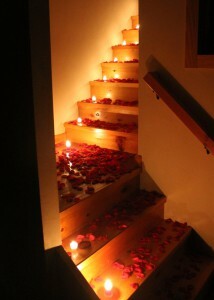 Make it a candlelit room with a rose petals and candles package. A heart. When you think of Valentine’s Day, you think of red hearts. Why not create one out of rose petals? Spell it with petals. Don’t get tongue-tied, write it out using rose petals to make it perfect. The tub. Soothing… relaxing… some bubbles, candles and rose petals. Sprinkle some petals around the tub to top it off. Suspended petals. With fishing line, you can string up petals for a really neat effect. Be warned, this one can take some time. The drop. With the help of friends, sprinkle the petals from a balcony or rooftop. Make sure you come up with a signal so you have perfect timing. The Car. Wouldn’t it be a cool surprise for someone to leave work to find a car full of petals? Well, maybe not completely full, but you get the idea. Include driving instructions to a restaurant or wherever you plan to meet. Table setting. Not going out for dinner? A candlelit dinner at home can work just as well. Use rose petals around the table to add elegance. Yard design. Leave a note for your special someone to look outside to see your message written in rose petals across the yard. Packing. Have a surprise gift? Pack it in rose petals. Petal notes. Write one word of a sentence on each silk petal and put them in order in the pages of a book they are reading or in a greeting card. A simple, yet tasteful idea. Drawer full of petals. Empty out a drawer full of underwear and socks and replace it with petals and other fun items. You can be creative here. Hotel room. If you can’t get away to get into the room ahead of time, see if the hotel can decorate the room for you. You can easily ship the petals directly to the hotel, just put your name and when you’re arriving on the label. There are lots of other ways to use rose petals on Valentine’s Day, these are just a few that come to mind. If you’re ready to get some petals, we have some great specials on rose petal packages. Remember, you don’t have to be romantic on just one day of the year. This entry was posted in Romance on January 23, 2014 by admin.